TheWealthyDentist.com dental marketing special ends at midnight Friday night. For just $1 (one dollar), dentists can learn how to use their practice answering machines to generate new patients. I want to be sure that, even when you're not at work, your answering machine message is working for you! The $1 (one dollar) dental marketing special at TheWealthyDentist.com ends at midnight tonight. The "Answering Machine Marketing for Dentists" video training provides a step-by-step strategy for generating new dental patient leads -- using existing tools. More than 50% of Americans access the internet via high speed broadband, and most of the rest are online via dialup connections. With close to 100% of American consumers now researching and buying products and services online, the internet is now the best place to reach the majority of prospective patients. Most dental practices need to attract both high value and general dentistry patients in order to succeed financially. The Wealthy Dentist's "Answering Machine Marketing for Dentists" works 24/7 to capture leads for potential patients looking for high-value dental services as well as those looking for general family dentistry. “Your dental practice answering machine can be a great marketing tool to generate new patients if you use it correctly. The right message can make all the difference... and the wrong message can cost you potential new patients," said dental marketing guru Jim Du Molin, Editor in Chief of TheWealthyDentist.com. "I take you through the scripts step-by-step because I want you to understand the psychology and marketing behind the answering machine messages." Using proven scripts, "Answering Machine Marketing for Dentists" can be used to attract both high-value and general dentistry patients. The answering machine scripts direct callers to the office's dental websites where visitors can get more information about services, and then fill out an appointment request online. The dental practice websites are designed so that visitors can easily transition through the sales cycle from interest, to product education, to product inquiry conversion (appointment setting) so that new patient leads are more easily converted into sales. "I want to be sure that, even when you're not at work, your answering machine message is working for you!" added Du Molin. In addition to the video, the tutorial includes MP3 audio files and downloadable scripts that teach exactly what to say. Using these step-by-step resources, the strategy can be implemented within 30 minutes. Jim Du Molin -- Editor in Chief of TheWealthyDentist.com -- has been giving hype-free dental marketing and practice management advice since 1985. He helps dentists attract more patients and run their practices more effectively. 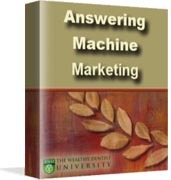 Visit http://TheWealthyDentist.com/dental-marketing/answering-machine.htm to buy the "Answering Machine Marketing for Dentists" tutorial, and for details about the $1 dental marketing special offer.